With press releases of grand openings, beer samples of your top brews, glassware of the brewery, brewery tours, swag, and lessons on the market of craft brews, getting people the knowledge of your brewery is work in itself. Getting all of this completed and still getting time to brew the beer is a whole other subject, so how do you get it all completed fast enough to make your product relevant? Well, getting the correct marketing completed when your brewery opens OR when you create a new brew is key to launching your products and creating a name for yourself in your marketplace. Did you know there are over 4,100 craft breweries in the U.S.A currently? What will you do to separate yourself from all of those other brands? Anheuser-Busch Method-You can use the Anheuser-Busch/ InBev NV Anheuser-Busch InBev NV BUD, -0.59% Strategy. Anheuser has bought brewers like Elysian, Goose Island, Breckenridge, Blue Point, Four Peaks, etc for their brew stock (different brews offered within each brand), relativity within their own market space, The known “Name” within their individual markets, and their quality of products. If you can stay relevant within your market and can stay up to par with brands like these, then you are on your way to success. Marketing Strategy-So do you create loads of swag to give away? NO. The best way to create more sales for your product and to create a true name for your brand is to SAMPLE your products to the masses! Even if you don’t get a ton of sales every time, The consumer will learn your products and remember the time they went to the liquor store and got to try your brew, or went to the festival and tried your products. You can give away some bottle openers or a glass WHEN product is purchased and that will help boost sales, however SAMPLE SAMPLE SAMPLE and you will see your sales grow in your market. We here at Lucky415 are staffed with an In-house Beer and Liquor expert. We not only provide support and training for each event, but our team behind the scenes is constantly training on new brands (Major brands with Anheuser-Busch and MillerCoors and smaller Craft brands as well) in both Beer and in Liquor each month, so as new brews, wines, and liquors come out, our team is on top of it. We can support our team in the field with the proper training on all brands that come through to us. If you are looking for a new way to build your brand, send us a message with your request today and we can create a custom quote for you and your brand! San Francisco Night Market Ambassadors! Brand Ambassadors needed for SantaCon SF 2016! Lucky 415 Marketing and Promotions Inc. is a nationwide event-staffing and promotions company that works day and night to make sure brands and promotions will be represented to perfection by the best brand ambassadors, talent, and event teams. With a data base of over 25,000 event staff, brand ambassadors, street-teams, models, trade show hosts, market managers, and tour managers, we provide all types of talent for events anywhere in the US or Canada for any kind of event or promotion. 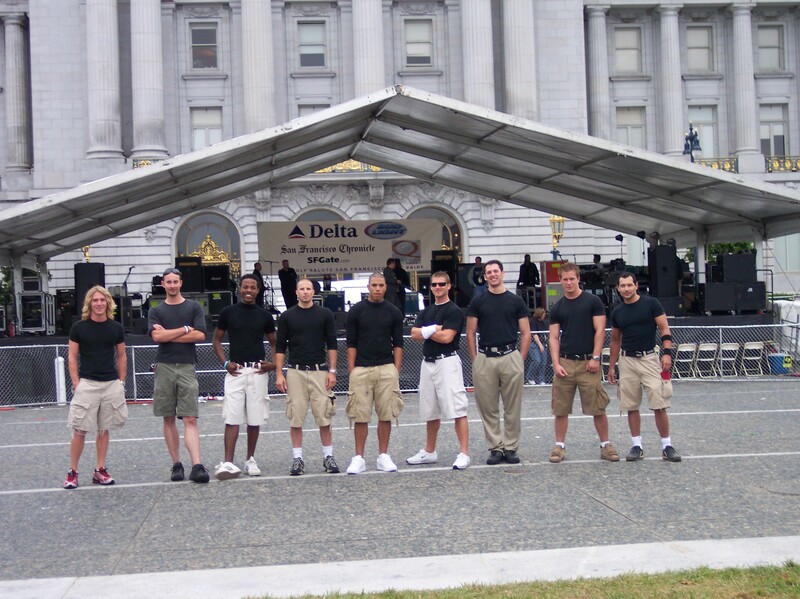 We love to provide street teams and sampling teams in San Francisco. San Francisco is a perfect place for product sampling. San Francisco usually has decent weather, tons of tourist, and lots of consumers. It is by far one of the best cities for sampling a product or giving out free promo items. San Francisco Street Teams in action! Guerilla marketing, Sampling Teams, and Moscone Center Trade Show Hosts and street teams.